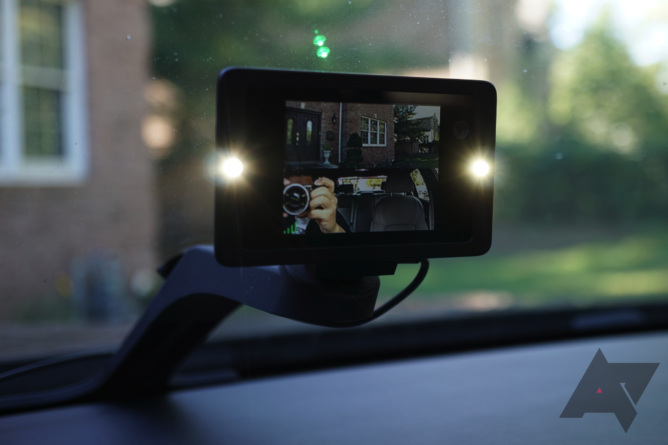 The Car Cam is certainly a well-made piece of hardware, and it might be well-suited for your needs. It does a lot of things that other dashcams can't do, but given its $349 price, it'd be shameful if it didn't. However, it has a couple of flaws that prevent it from becoming my dashcam of choice. Cameras The 1440p video quality is clear, and license plates are easily readable. There's an in-cabin camera as well. 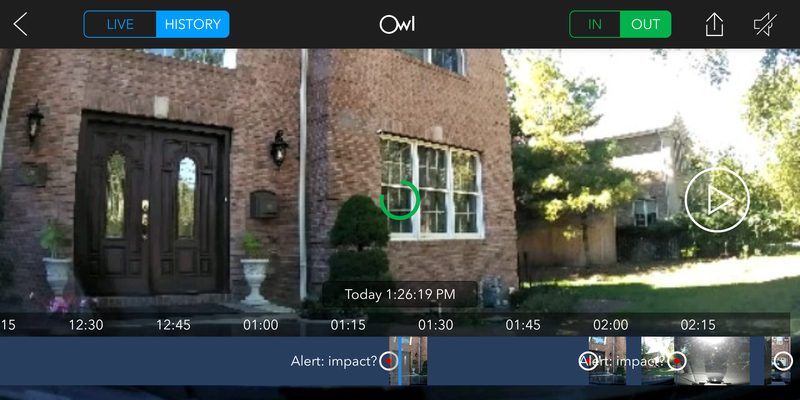 LTE It allows videos to be easily backed up and alerts to be sent to your phone. GPS It should come in handy if you forget where you parked. Price $349 is a hard pill to swallow, especially since you'll have to start paying a monthly fee after a year (if you want to keep using LTE, which you will). OBD I get that Owl went this route to keep the camera powered when the car is off, but my car wasn't too happy about that. Plus, the use of the port could interfere with other tools that need to access it, it still only records when motion is detected, and it still times out after 24 hours. Mounting position I'm no lawyer, but it looks like this could be grounds for an obstruction of view ticket in many US states. As soon as you take a look at the surprisingly large box, it's clear that Owl values presentation. It contains an almost daunting amount of pieces, though many of them won't be used. More assembly is needed than I expected; there are several "arms" and "tails" included that you can mix-and-match until the ideal position and height of the camera is reached in your car. 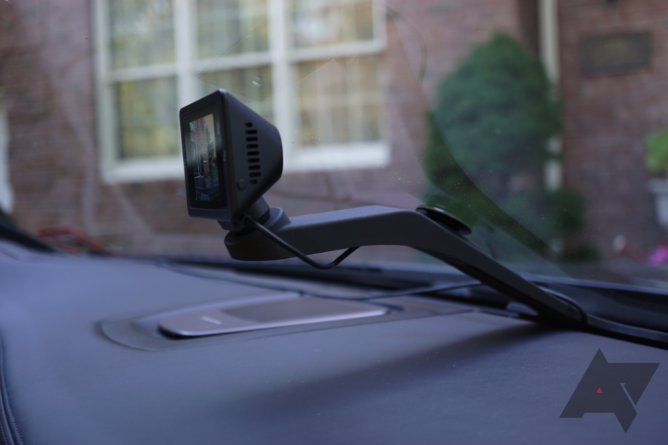 Once that's done, a suction cup on the windshield holds the camera in place. You then have to run the magnetic power cable from the camera into an OBD adapter, which then slots into your car's OBD port. Owl includes a tuck tool and cable ties in the box so that you can hide the wire in the crevices of your car. Pairing is accomplished by scanning a QR code on the camera's screen when it's plugged in for the first time. The camera itself is inoffensive in design, if a bit bland. It almost looks like an old in-car GPS system, albeit about half as large. The body is metal, with a small window for the main camera (and logo) on the back and a vent and a speaker on the side. Up front is a 2.4" 320x240 LCD touchscreen, a secondary cabin-facing camera, two microphones, and two white LEDs. 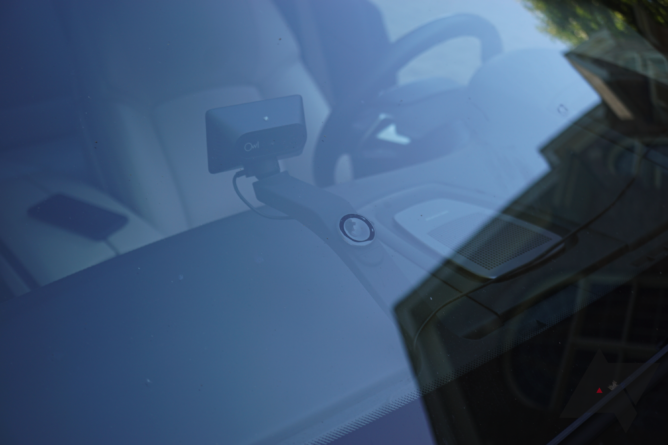 A green LED on top blinks when the camera is active and the car is parked, letting passersby know that your car is "protected." Owl touts a 2.2GHz octa-core processor and 3GB of RAM, which is more power than I've ever imagined a dashcam would need. That being said, most dashcams don't use 4G LTE to upload videos to the cloud. GPS is inside as well. 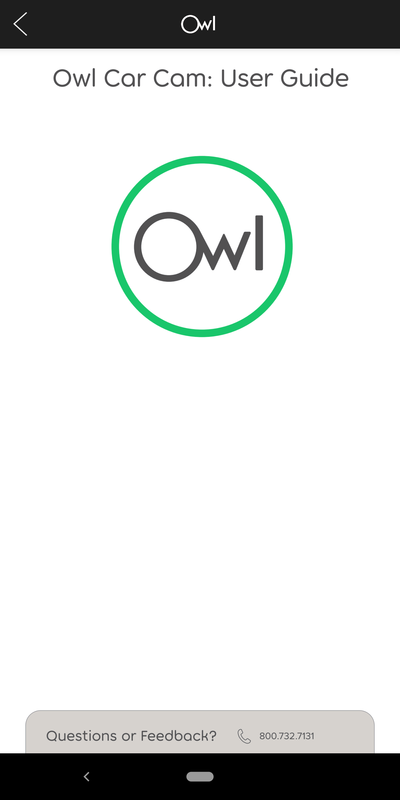 No storage figure is given; Owl simply says that it "stores video on your camera for up to 14 days depending how much you drive." (Update: Owl has clarified to us that there's 64GB of storage.) There's also no microSD slot, so you can't even expand the likely limited amount of storage. Note that an OBDII port is necessary for this camera to be powered. I'm not a fan of this for a number of reasons. First of all, it restricts cars made prior to 1996, as well as the Tesla Model 3, from being able to use it. I recognize this is a small portion of potential customers being turned away, but it's still worth noting. Next, the OBDII requirement also blocks other devices that need to use the port, such as code readers (some people leave them in), insurance trackers, and hotspots like T-Mobile's SyncUP DRIVE. Lastly, if you leave your car at the mechanic and want to check your dashcam to see how things are going, it's entirely likely that it gets unplugged so that an OBD code reader can be used, leaving you without any footage. Here's another ding towards the Owl: as you've probably noticed by now, it mounts from the bottom of the windshield, not the top. This means that it gets in the way of your vision while driving. I don't necessarily mind that - it's not big enough to realistically block anything - but the law in much of the US does mind. I'm not a lawyer and I can't comb through 50 states' unique phrasings on this situation, but there are only two - yes, two - states that have no windshield restrictions. I doubt you'll get pulled over if you're driving normally, but if you've already been pulled over and the officer sees the Car Cam in the middle of your windshield, you could easily be on the hook for an obstruction of view ticket as well. See this Lifewire.com page and this reddit thread for more information. 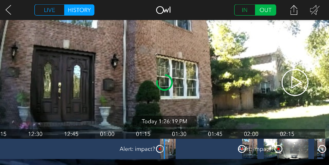 The Owl Car Cam is supported by your dashboard, and in many jurisdictions there are not restrictions on the placement shown in our videos. 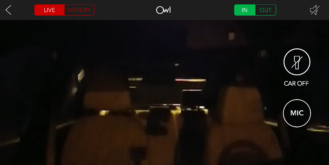 The Owl Car Cam can be mounted off to the right or left side of the dashboard if desired. We advise people to check their local regulations and how they are enforced in their local area. In other words, Owl acknowledges that this may be an issue in certain areas, and says that it can be mounted on the right or left ends of the dashboard in those situations. However, that kind of defeats the purpose of a dashcam, given that it wouldn't be able to see everything that's happening on the road. It's not unusual for more high-end dashcams to have two cameras these days, so we're not surprised to see a pair here. The main one is a 4MP sensor with an f/2.14 aperture and 120-degree FoV, whereas a 1MP sensor is used for the in-cabin recording. The exterior camera shoots 1440p video at 30fps, while the interior one takes 720p at 30fps. Neither resolution/frame rate is adjustable. I found the video quality to be crisp for the most part, and the wide-angle lens can cram quite a few lanes into the frame. Basically any dashcam will be able to capture an accident and show the circumstances surrounding it, but it really takes 1440p video to be able to reliably show license plates. There had been complaints about low-light video, though they appear to have been addressed from what I can see. Take a peek at the video samples to get a closer look. 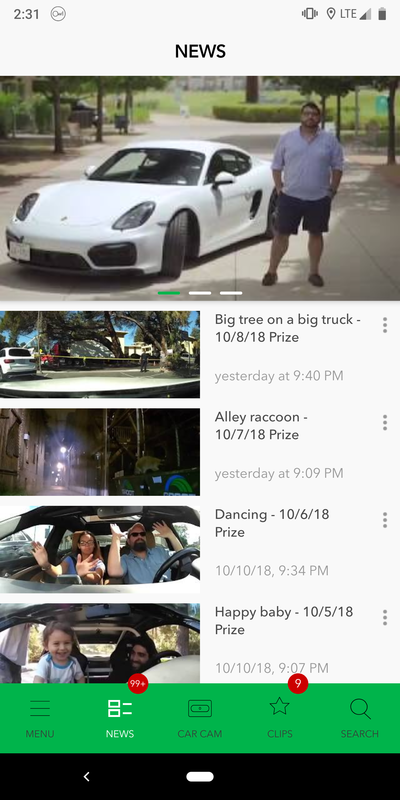 Unfortunately, because the Owl app wouldn't let me download the videos in 1440p resolution for some reason, these are screen recordings of the footage from my phone. I'll go more into this below. As for the front-facing camera... well, it works. The 720p video isn't going to impress anybody, but it doesn't really need to. 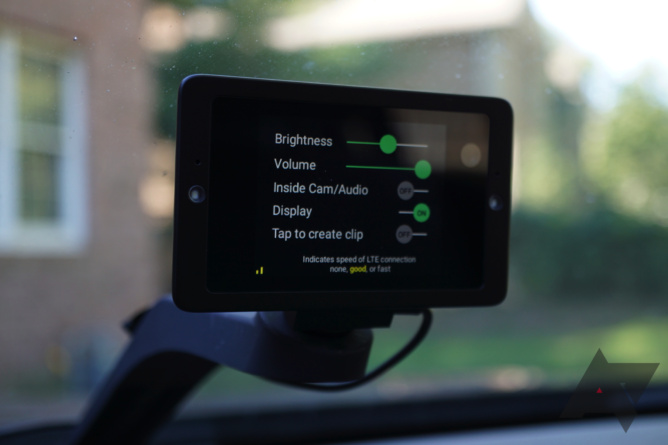 The in-cabin camera can easily be enabled or disabled via a vertical swipe on the touchscreen, though it'll automatically come on (with the LEDs) if the Car Cam detects an accident or break-in of some sort. 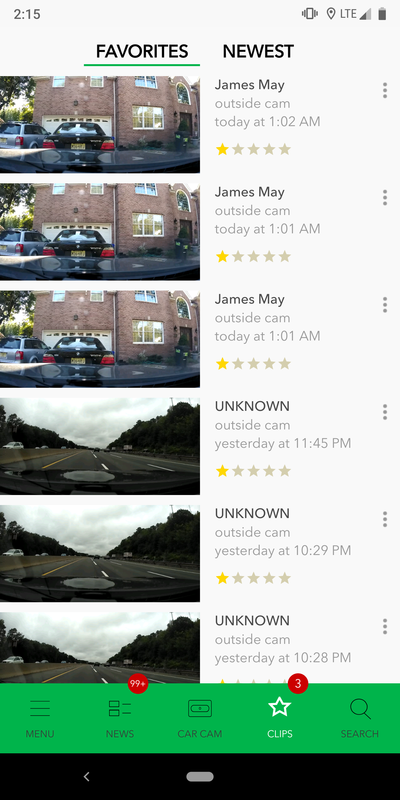 Speaking of the accident detection, a friend knocked several times on a window while the car was parked and footage from both cameras was sent to my phone, so it's good to know that it does kick in when needed. One of my favorite features of the Car Cam is the ability to simply say "OK Presto" and have the camera record a ~20-second clip of the events that occurred prior to your voice command. You can even name the clip by saying the title after the "OK Presto" command, which is then put on your phone via voice-to-text so long as the background isn't too loud. This is rather helpful while driving, as you don't have to take your eyes off the road or click a button. There is an option to tap the display to begin recording, but I don't see any reason why you'd need to unless music's blasting or a bunch of people are having a screaming match. "James May" was the only thing I could think of when prompted for a title. Also, I'm not sure why two of the clips' thumbnails are so bright. 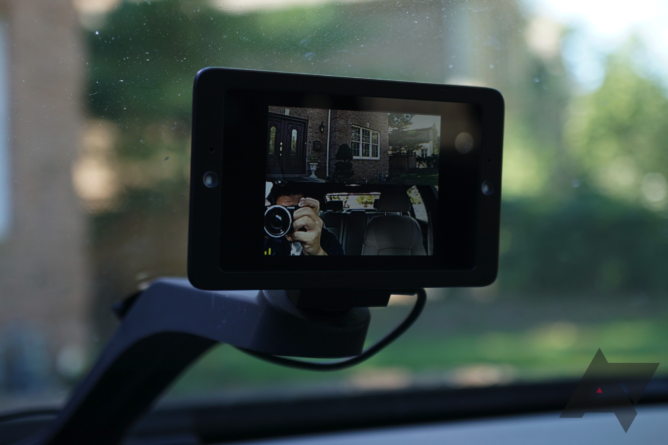 Features weren't something I specifically had to mention in the VAVA Dash Cam 2K review, but given that the Owl Car Cam costs around four times as much, there had better be some fancy extras to back the price up. The first I'd like to mention is the LTE, which runs off of AT&T's towers. The resolution of the video streamed over is incredibly low, but I suppose that doesn't really matter since you can download the video in full resolution if it's needed. 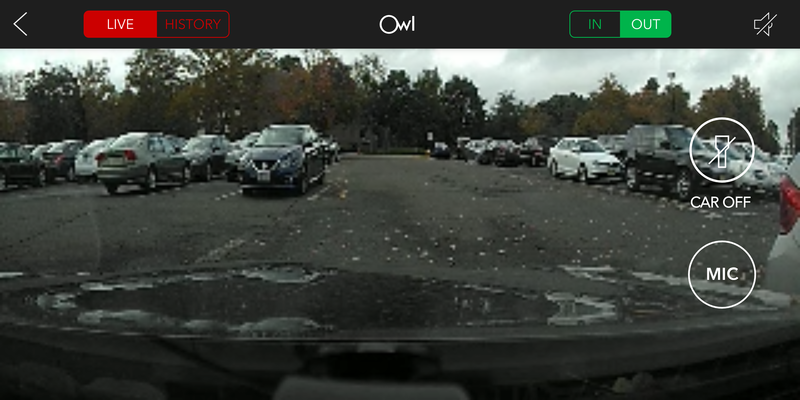 Owl made the decision to not include any expandable storage, which most other dashcams rely solely on. Instead, we get an unspecified amount of storage, which contains clips that are automatically uploaded to the cloud via the LTE connection. The first 12 months of service are included for free in the $349 price, but it'll cost $10/month after. It's not necessary to have the data connection afterwards, as clips will be able to be offloaded via Wi-Fi Direct just like every other dashcam. At that point, though, the Owl Car Cam would effectively be inferior to much cheaper options since it has limited storage and no microSD support. Basically, you're going to be stuck paying that $10/month afterwards. That's not the only fee you might have to pay, though. 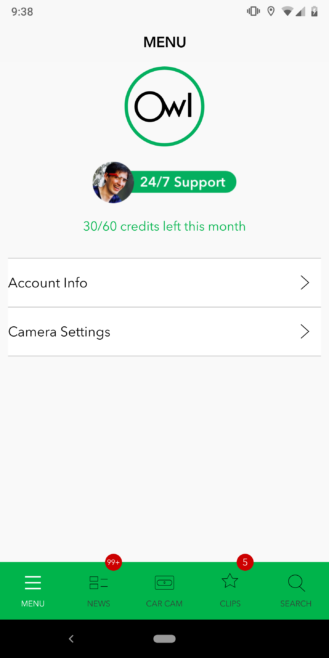 You can view 60 minutes of footage, or "credits," per month, but any more than that and you'll have to pony up $5 for another 60 credits. Owl says that it's unlikely you'll view that many minutes of clips in a month, but there are definitely circumstances in which someone might go over that. For what it's worth, I was left with only 30/60 credits after just a few days of testing. There are several things the LTE is good for, and live streaming the video feeds to your phone is one. Both front and in-cabin views are accessible, and you can turn on the LEDs for the in-car view to get a better look at whatever might be going on. A mic button allows you to talk to whoever/whatever is in the car, though I kind of doubt anyone is going to be striking a conversation with a thief. Unfortunately, it's not going to work if your car's been sitting for more than 24 hours, but it's better than nothing. Owl has stated that it's working on a 72-hour mode, but we haven't seen anything yet on that front. And who knows how much more taxing that'll be on your car's battery? The LEDs can be helpful in the dark. The other primary reason you'd want LTE is in the event of a break-in. 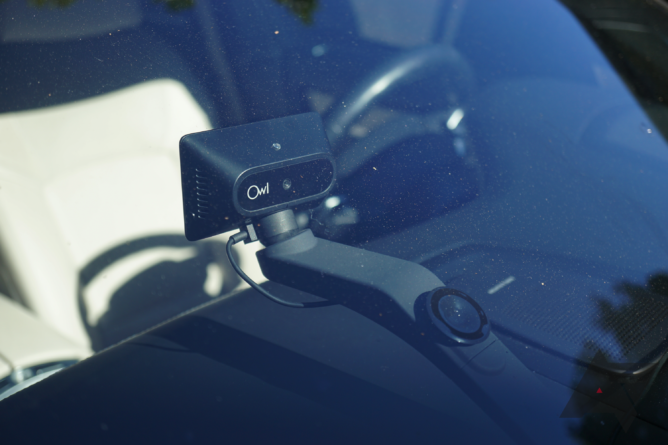 Whereas a thief would be able to make off with your camera and you'd lose all your footage with a regular, microSD-equipped dashcam, the Owl Car Cam should be able to wake up, shine the LEDs to get a better look inside, and upload the footage to the cloud before it's unplugged. 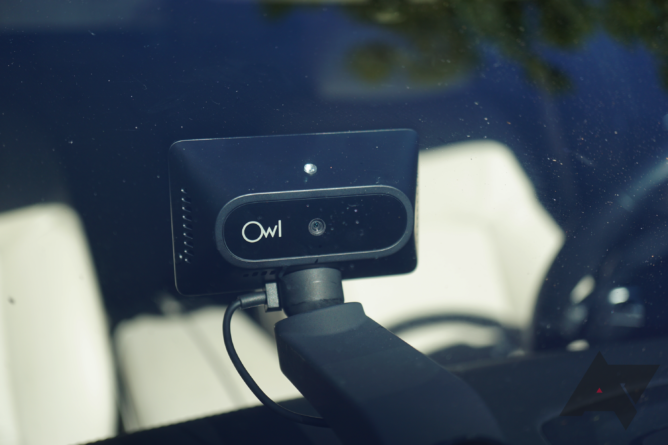 Plus, Owl will replace your stolen Car Cam if you can prove it with police documents. I should note that if you haven't paired your phone with the camera via Bluetooth, or if you've paired your phone but Bluetooth is off, this theft feature will activate every single time you get into your car and shine the front LEDs into your eyes. Hell, even after I had my phone paired, the lights would still occasionally come on for some reason when I got in the car. This can get especially annoying at night. GPS isn't as rare to find on a dashcam, but it's still worth pointing out. It's probably not going to be of much help if your car gets stolen and you're trying to track it down - a dashcam would likely be the first thing a thief unplugs - but it might come in handy if you forget where you parked. The app uses Google Maps to show where the car is and where you are, which is pretty convenient. Some other dashcams can synchronize GPS location to saved clips, but the Car Cam unfortunately can't do that. The 24/7 support sounds good on paper, but in reality, I'm not sure how useful it is. You can choose between a live chat or a phone call, and the app says that you'll typically connect to a rep in under ten minutes. I had to use it two times; in the first instance, I had an issue with a new phone not being able to connect to the camera, and the representative on the other end helped me sort things out in around 15 minutes by registering the camera to my account. My second time, however, was a lot less successful. I told the rep about not being able to download saved clips locally in full resolution, but he was unable to provide any real help, instead blaming my Pixel 2 XL for being the issue. Given that the Pixel 2 (XL) is one of the three Android devices Owl tests with, I'm not so sure about that. He also had 10+ minute response times, and since the Owl app doesn't send notifications when a rep responds to your query if you're not in the app, it ended up being a rather lengthy conversation leading to nothing. The rest of the app has some interesting stuff. 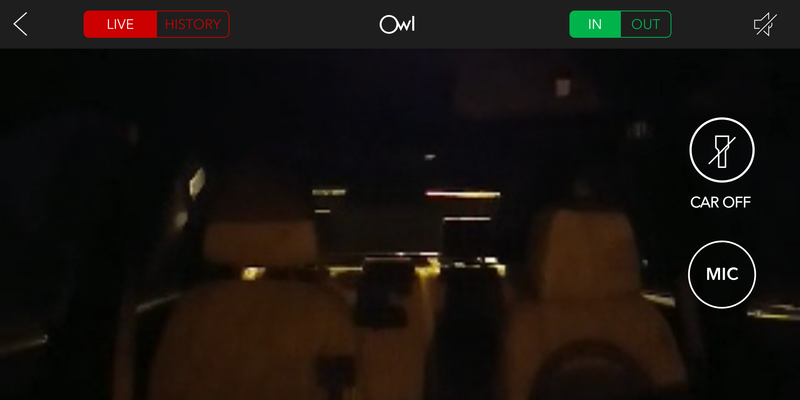 There's a "News" tab that contains memorable moments captured by others on Owl Car Cams. Owl pays out $1,000 every day for one of those moments, so I suppose that's part of where your $349 is going. You can also view the instruction manual here, which could come in handy. No. 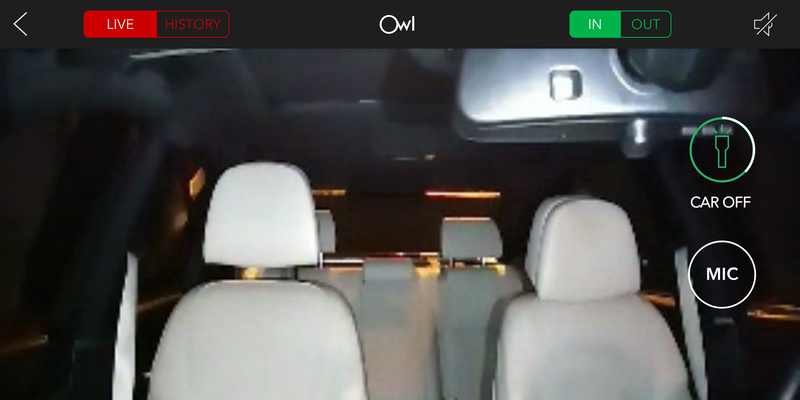 At the end of the day, the choice is yours, but I wouldn't purchase an Owl Car Cam for myself. It does some things well, but at $349, I'd expect everything to be top-notch. Owl's logic behind the use of the always-powered OBD port makes sense in theory, but if the camera is going to shut off after 24 hours (or be shut off by your car's electrical system, like mine), the port doesn't really do any good. Plus, it won't work with pre-1996 cars, and it'll take up valuable space occupied by other OBD devices you might be using. I'm also not sure what the appeal of constant power via OBD is if the camera isn't constantly recording when the car is parked; it'll still produce the same delayed motion-based signal if the car gets damaged while you're not there as much cheaper dashcams. $349 is a big chunk of change for a dashcam, and after a year, you'll have to either start paying $10/month for LTE after a year, which could add up quickly, or deal with Wi-Fi Direct, which is no fun at all since there's no microSD slot. 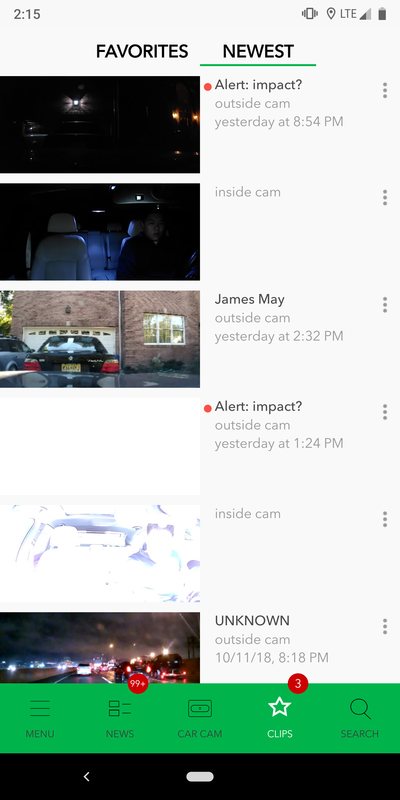 I do like how you might be able to get a glimpse of a potential thief's face before the Car Cam is disconnected and stolen thanks to the LTE, but in reality, we can't be 100% sure if the alerts will wake it up in time to upload before power is cut off. Plus, that won't be much help if it's been 24 hours since you parked or the camera is otherwise turned off. The same goes for the GPS; it'll cease to be useful without power. In my opinion, a battery backup really should have been implemented for these scenarios. That also would have meant that a standard cigarette lighter could be used for power and not the OBDII port. The camera quality is good, but it's good on any 1440p dashcam, and there's no shortage of those on the market. The "OK Presto" voice command is nice to have, but it's not so special that I couldn't live without it. 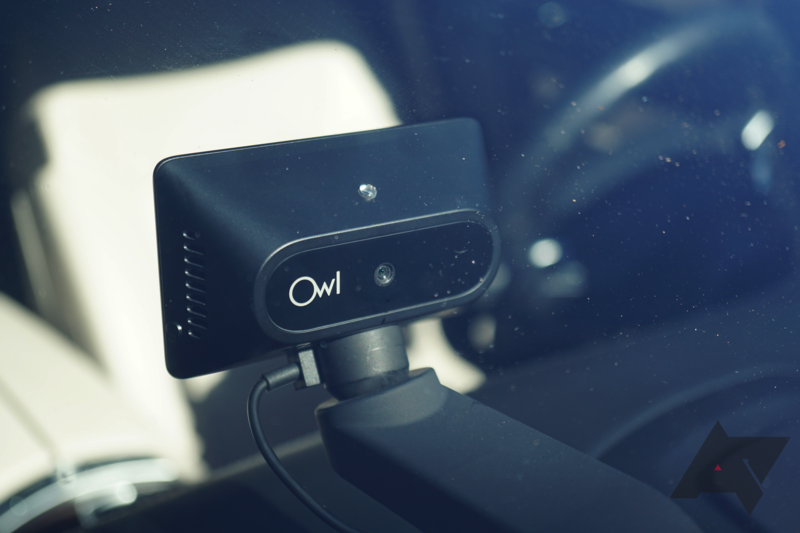 My last qualm is with the way the Car Cam's mount is inherently designed, which is without a doubt more likely to lead to obstruction of view tickets than other dashcams. Personally, I prefer my dashcams to save me from tickets, not cause them. I like the idea of a dashcam with a mobile data connection, but after having used one, I'm not sure how plausible it is with data costs and battery concerns. It seems to me like it causes more trouble (and a lot more money to be spent) than the convenience is worth. 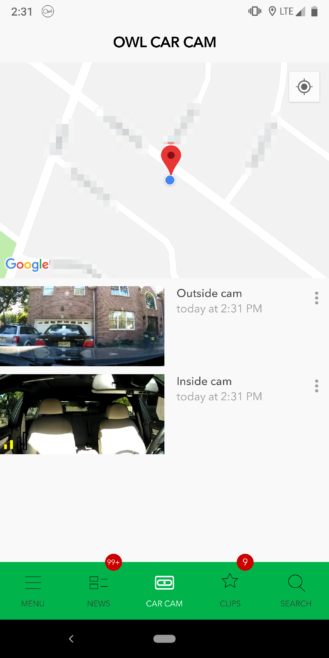 If you drive around often and want to be able to monitor your car remotely. If you don't mind paying $349 + $10/month after a year. If you value camera quality and want an in-cabin camera as well. If your car sits for more than a day at a time. If you're looking for constant recording, even when parked. If you're worried about receiving obstruction of view tickets. Think that the Owl Car Cam might be a good fit for you? You can purchase one from Owl's official site for $349.